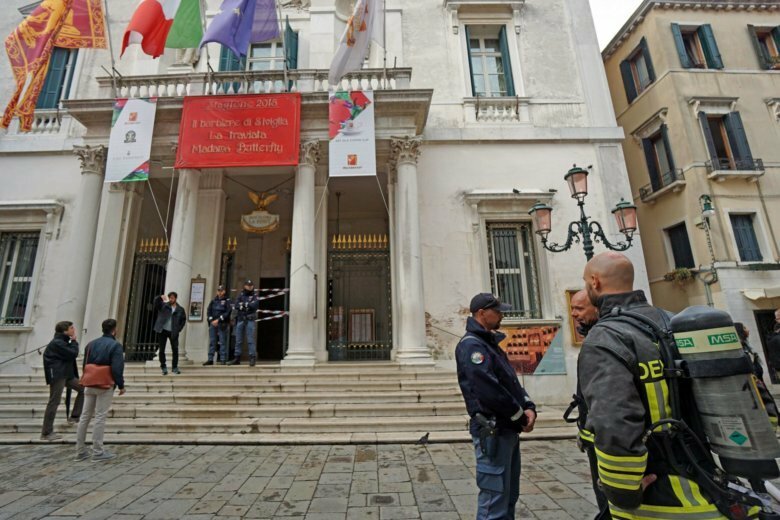 MILAN (AP) — A fire in Venice’s rebuilt La Fenice opera house was swiftly brought under control Monday, 22 years after a blaze had destroyed the famous theater. Italian news agency ANSA reported that the fire broke out early Monday in a technical room that was under 24-hour surveillance as a precaution following the fire in 1996, which was ruled as arson. A dozen firefighters responded to the fire, containing it quickly. Two were treated and released for smoke inhalation. The theater’s general manager, Fortunato Ortombina, told ANSA that the fire was caused by the theater’s backup power system. He said the extent of damage was still being assessed. No concerts were scheduled Monday. Performances in the main theater are expected to resume as scheduled Thursday while two concerts scheduled in the smaller Sale Apollinee for Tuesday have been moved to another location. The theater, originally constructed in 1792, hosted world premieres of such conductors as Verdi and Rossini. After being destroyed, it reopened in 2004, built substantially as it had been before the fire.